Groundwater is a valuable water resource, and it is used for domestic, industrial or agricultural use around the world. Especially, water use in paddy fields is very large, and it influences groundwater in Japan. However, it is difficult to understand its water balance and to control it for management, because it flows under the ground and is affected by a lot of processes in the hydrologic cycle. Therefore, a hydrologic model, which includes the groundwater system, is required for analysis and management. 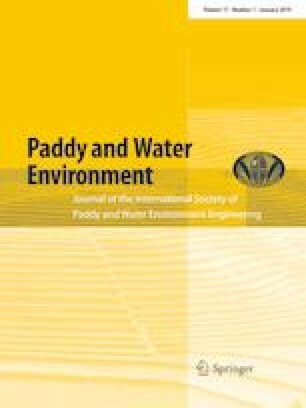 In this paper, a lumped parametric hydrological model was applied to two different coastal areas to discuss influences of irrigation water use on groundwater. The hydrologic model had good performance in estimating the groundwater level, and it was considered that the model could explain the hydrologic cycle in the areas. Annual water balance in the study area was then calculated using the model to evaluate the effects of irrigation water use on groundwater in each area. The results indicated that (1) percolation to an aquifer consists of infiltration from surface and seepage from rivers. The annual amount of percolation to an aquifer may be more than rainfall in the study area and be equal to several times the total use of groundwater in the areas. (2) However, over-pumping of groundwater in the irrigation season causes lowering of the level and seawater intrusion in one area. On the other hand, decrease in percolation due to reduction in seepage from rivers and infiltration from paddy fields that originated from highly turbid river water is a serious problem in another area.